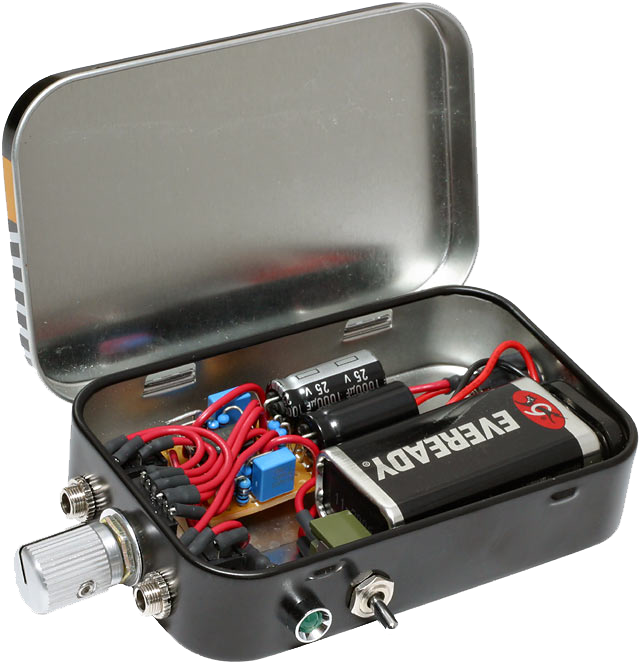 The CMoy headphone amplifier came about many years ago as an invention of Chu Moy on the HeadWize headphone board. It was a simple and low-parts design featuring either a single or dual-channel op-amp. 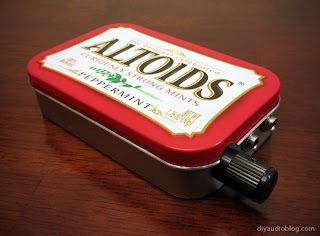 There have been many iterations of the CMoy since it was introduced, many of which are put together on a proto-board, and are traditionally stuffed in a Altoids Tin. During a day of wandering the interwebs, I stumbled upon JDSLabs website. JDS has created what he calls the CMoyBB, which is very simply, a CMoy with Bass Boost. In the interest of a simple build, a circuit board was created that fits perfectly within an Altoids tin (including the rounded edges). Depending on one's preferences, a rechargeable version can also be built. The JDS Labs website has everything you need to get started. 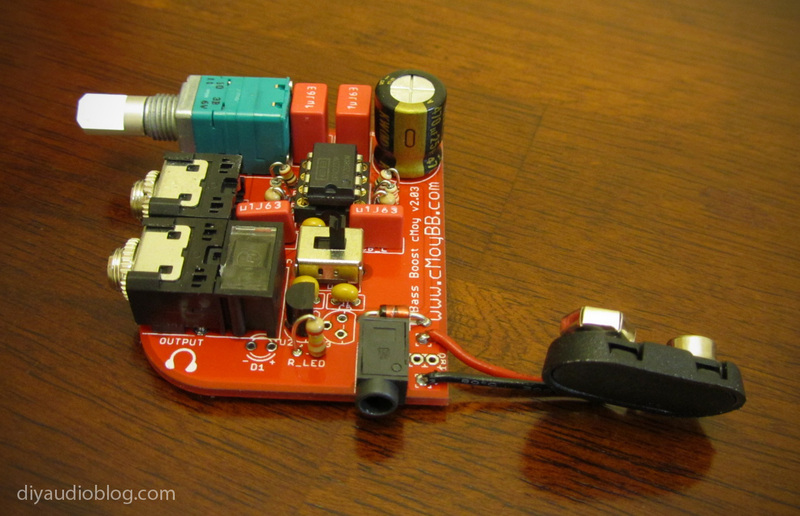 The PCB, as well as a number of parts and accessories are carried for your convenience. The documentation is incredibly well laid-out, and includes myriad options should one decide to stray from the standard build. The only thing you need to do is make a quick trip to Mouser with the bill of materials and get the remaining parts. 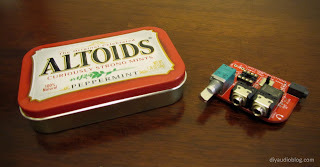 All items below, aside from the Altoids tin and OpAmp socket, were from JDS. Between a few parts I had in the parts bin and a Mouser order, the PCB is nearly done. I had a nice 9V battery strap I had procured that's made of hard plastic rather than the typical flimsy PVC you find on some straps. For the film caps, I chose to populate the board with WIMAs, the resistors are nearly all hand-matched carbon film aside from the 10.2K which isn't available, so metal film was used in that position. As stated ad nauseum in other posts; I prefer carbon film over metal film. The Burr Brown OPA2227PA was chosen for Opamp duty, as I prefer the generally warmer, bassier sound of Burr Brown OpAmps as compared to the general sound of Analog Devices OpAmps. This little board will be configured for single 9V battery operation, so ignore the little yellow capacitor in C5 in the photo below; it won't be needed. When preparing an Altoids tin (or any other thin tin packaging), delicacy is a must. Either a good quality hole punch should be used, or a hand-drill and Dremel combination with some patience. The latter involves making a very small hole with the drill, then slowly enlarging it with Dremel bits. The hole punch is much easier, but it can be difficult to procure a high-quality one that will punch metal easily. 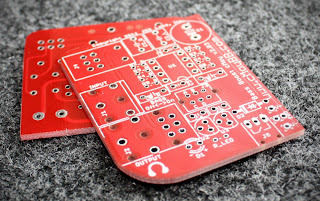 Below is a photo with the 5 holes punched in the tin and some electric tape placed where the PCB will sit. 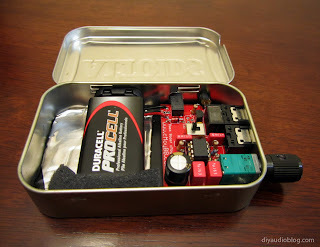 This will prevent any unwanted shorting of the soldered traces on the underside to the tin. Now the board can be placed inside the prepped tin. Once everything is fit where it is supposed to be, the nuts are screwed to the 1/8" jacks, the knob is placed on the potentiometer shaft, and the plastic grommet for the LED is placed in the corresponding punched hole. 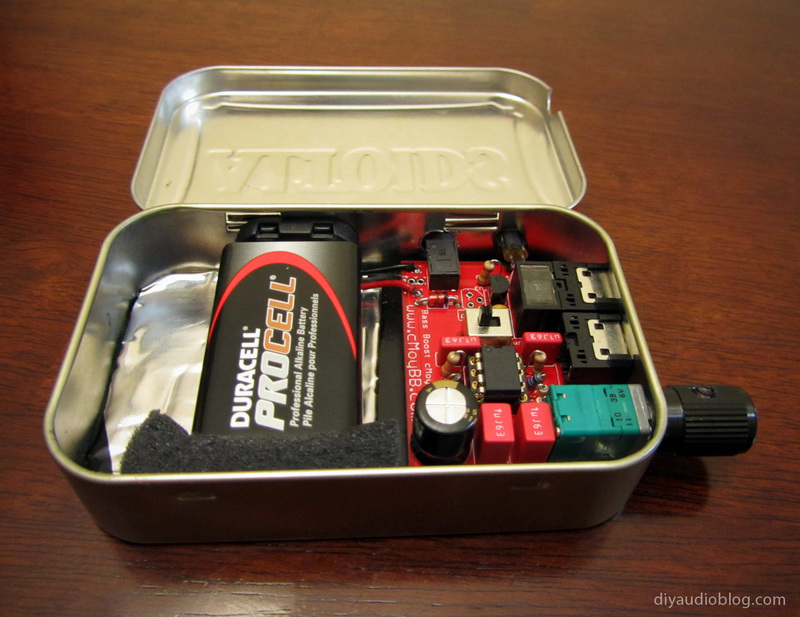 The 9V battery is then attached to the battery straps and a piece of adhesive foam placed along the side of the tin. This will prevent the battery from moving about during transport. A small piece of Dynamat was placed underneath to further cushion the battery. Here's a photo of the completed amplifier with the case closed. Note that the area above the knob was dremelled away to allow unimpeded volume adjustment. This was a very quick and enjoyable little project from JDSLabs, and one of the most well thought out CMoy amplifiers I've seen. 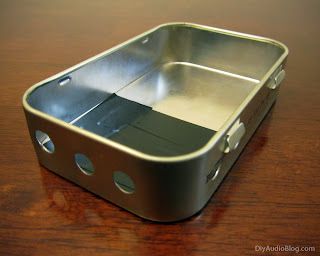 If you like headphone amplifiers in small candy tins, be sure to check out my post on the Miu Audio RA-1 Amplifier. Looking for a custom audio cable for your portable device or amplifier? Zynsonix Audio offers a number of great solutions.